Linked to my previous post with the super helpful Life Plan document, I thought worth sharing what makes a good plan, whether it's for sporting challenges, career goals and/ or life. Having just reinvigorated my challenge prowess, with the '24 hours in a day' relay challenge, I am back feeling the power of a good goal. This post summarises my research around the topic of setting and sticking to a worthy goal! The challenge involved running 10km at each hour of the clock over the course of the month that the I Move London Relay was on. So that's a 1am stage, 2am, 3am…all the way back around to midnight. I choose to do it when I noticed, though I was leading the operations of the month long running relay, I wasn't doing much running myself - and that's not what Exerk is about! Needless to say, I wasn’t clever and calculated about it – I only decided to do this 10 days into the month, then was at Love Trails Festival for 3 days so really only had 2 weeks to do it! Which meant 30km and 20km totals on several days, with breaks between the stages to shower (remember how hot July was!!) and get some work done. Focus in on what's important - don't be too scatter gun with theme and number of goals. Be clear on why you're doing the challenge, what succeeding in that goal is, when you're starting and finishing - deadlines are very useful for focusing on. This will help you set meaningful goals you actually want. I hear so many stories about someone saying they're going to run a half marathon with no desire to actually do it...just that their friend did it once so they thought they might as well! Get rid of the fluff! (Important thing for the '24 hours in a day' challenge was to build running into my routine in a fun and purposeful way. Completing it had a deadline of 29th July, and would mean 240km, and have lots of memories). Bringing people along with you on the journey (physically or remotely) will provide the social accountability to stick with it. Tell people about your plan - colleagues are the best as you see them every day and psychology determines most of us want to be seen as people of our words. Saying it out loud will prove your commitment. If you're not willing to tell people, it is perhaps a symptom that your fear of failure will hold you back from success. If you're concerned it is weird to tell people, fundraising for a charity is a great way to tell people you're doing something brave. It also helps make the goal bigger than yourself. Reach mini milestones and feel progress and accomplishment. This is sooooo important! I put the lack of this down for my failure to have stuck with learning to do a backflip during the 52in52. The important thing is to know what starting and finishing looks like! 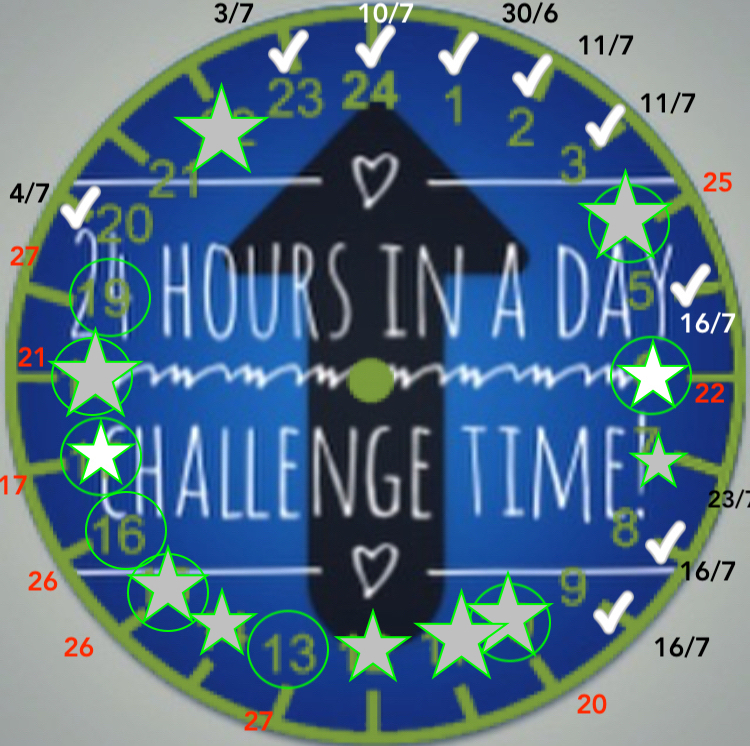 Have a way of visibly tracking your progress (the 52in52 was perfect for this....I immediately knew I was behind if I had done fewer challenges than the week count). It's like ticking off a to do list. Have you ever added something you'd actually already done without it being on the list, to your list, just so you can cross it off?......just me....I sporadically make a TA DA list! If you like the social side, you can use social media to help you self-monitor by posting everytime you do what you said you were going to do (or don't!). Stick the Life Plan form up on the inside of your cupboard so you look at it and remind yourself of it as often as possible. Make the goal as convenient as possible, line up the support you need, recognise that you can't do everything, learn to say no in order to prioritise your goal. Research shows that decisions made in advance are more considered, rational and aligned with the best version of ourselves. Our ad hoc decisions are more 'chimp', playing up to our instant gratifications. So for example, make a rule about not snoozing your alarm, know what you'll do if it's raining when you want to go for your run (still go! ), you get invited to something that clashes with your PT session....all you have to do is stick with those considered decisions (pre-mortem style). (Injury was the main concern for the 24 hours in a day relay challenge... I ran more that month than I had in the previous 12 months. Cue yoga - I booked an intro 20 day offer for £15 at MoreYoga which was right next to Tower Bridge, so before/ after each run, I would go there for my stretch! As regards 'can't be bothered'/ tiredness...applying these points will help mitigate that, but I always build flexibility in so I can swap and change timings o make it work around work (which was the operations of the relay itself!)). TWO ACTION ITEMS FROM ALL OF THAT. 1. Print (or hand draw as I'm going to do!) and fill in the Life Plan form by next Monday evening. If you like, feel free to send to me as long as nothing too personal in there!). 2. And let me know if a Team 52in52 sounds up your street - the beauty is anyone in your team can get involved from the person who wants to do a 70.3 ironman, to the person who wants to walk up the stairs rather than take the lift. Reply if you want more info. Chat next week, if not before. Feeling like the start of a new term for you too? !